El Centro de Medios Comunitarios de Marín (Community Media Center of Marin) y Los Servicios Comunitarios de San Rafael se complacen en anunciar las sesiones informativas en español acerca de los medios comunitarios qué se ofrecen en el condado de Marín. Las sesiones informativas, qué se realizaran al fin de Marzo y el principio de Abril, tienen la intención de informar a los residentes hispanohablantes acerca de los medios comunitarios y recursos qué ofrece el Centro de Medios Comunitarios de Marín. En CMCM nuestro compromiso es a ofrecer nuestros servicios en una manera equitativa a todos los residentes, organizaciones, instituciones educativas y agencias gubernamentales de todo el condado de Marín. Los medios comunitarios se enriquécen con la participación de residentes de todos los orígenes y lenguas. Ayúdenos a difundir la información acerca de las sesiones informativas qué se realizaran en el Centro Comunitario Albert J. Boro para hacer qué los medios de comunicación de la comunidad sean accesible para las personas qué no hablan inglés. We're excited to share with you the short documentary created by youth leaders from the YESS project. In partnership with the County of Marin, Canal Welcome Center, and the Community Media Center of Marin, high school students created a bilingual English-Spanish video about flood vulnerability and how youth can lead efforts to address climate change. Step up your social media game! Marketing expert Mike Wolpert, founder/CEO of Social Jumpstart, simplifies social media, demystifying how producers create space for their brands to live and thrive on the Internet. Free for CMCM members. Non-member fee of $25 includes one-year membership to CMCM and FREE admittance to all events in the series. Enhance videos with the magic of narration! Voicetrax instructor and working V/O artist Vicki Baum leads a lively interactive session that will give students the opportunity to explore their own narration abilities. Make your videos outstanding with animation! Digital video & graphics specialist Lance Scott breaks down the industry’s application of choice for digital visual effects, motion graphics, and compositing. Join the wave of people-powered media! Here is a great sidebar article from Marin Magazine's April issue. Be sure to pick up a copy and share with your friends. Check out the online version in the meantime. Get ready for a laugh riot when Marin TV televises a live-to-tape comedy show on Monday, October 26 at 10 PM. 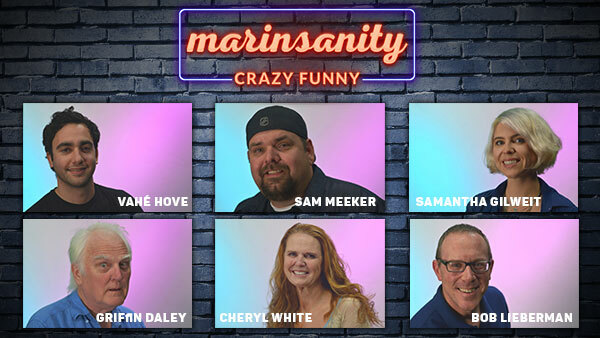 "MarINSANITY" will feature Bay Area comedians performing in front of a live studio audience. No joke! Please join us on Wednesday, February 7 at 7 PM for our Media Mixer! Producer Kathleen Nemetz will screen her short film exploring why bees are in peril. Join the buzz! Save our bees! A Message from the Marin Health and Human Services: Marin County continues to experience heavy drift smoke from the Camp Fire in Butte County, resulting in unhealthy air quality. The public health advisory issued Nov 9 remains in effect. Children, older adults, and people with heart and lung disease should avoid physical outdoor activity. Visit https://airnow.gov/ for air quality information, Marinhhs.org for health tips, and https://www.facebook.com/MarinCountySheriff/ for updates.